Product description: Consistently delivered faster than any bottled IPA on the planet, Stone Enjoy By IPA facilitated a paradigm shift in respect for and enjoyment of hoppy beers by ensuring craft beer fans the ultimate level of freshness. We brew this intense double IPA with more than 10 different hops, employing hop-bursting and dry-hopping techniques to amp up the peach and tropical fruit notes and overall hop factor. Brewed specifically NOT to last, this devastatingly fresh, golden beauty should be enjoyed within 37 days. 9.4% ABV, 90 IBUs. 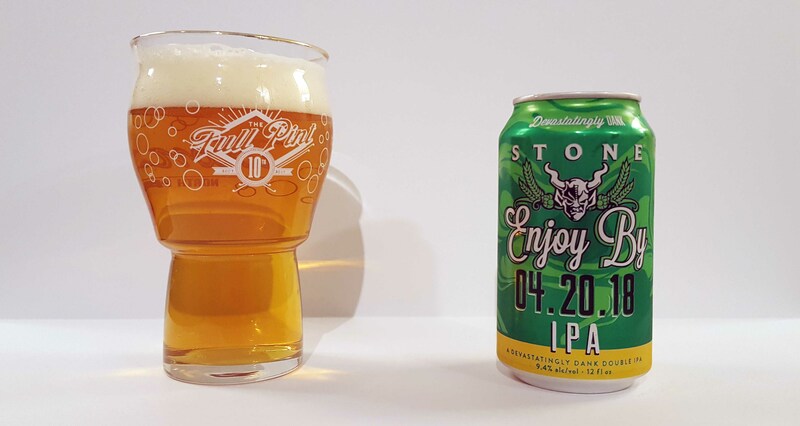 Stone’s Enjoy By IPA, which is a Double IPA on the stronger side at 9.4%, comes out multiple times per year, but it’s the 4.20 version that gets the most attention. The Enjoy By brand is probably one of the smartest beers to ever be made, as the best before date is the beer name – a big middle finger to all the retail stores that sell old IPA. For a while, this was available only in 22oz bombers. Now, this is available in 6-packs of 12oz cans as well. I sampled this from a 12oz can packaged on 3/14/18 or exactly two weeks ago. Into the glass, Enjoy By is crystal clear amber with medium-sized, whipped cream-looking foam that settles down relatively quickly. The aroma is supposed to be this massive onslaught of “dank” beta-acids, but there’s hardly anything like it. Instead, there’s a lot of alcohol and butterscotch toffee that combines into rum baba (rum-soaked sponge cake) dessert. Spend some time with it and you become desensitized to the fumy alcohol and get more expected aromas of sweetened red grapefruit, orange blossom honey, and herbal tea. Flavor-wise, sharper alcohol dominates the first few sips moving to a hefty wallop of red grapefruit bitterness in the mid-palate that builds up to an 8 out of 10 intensity. Given the alcohol content and kettle hop bitterness, I’m expecting this sweet, dense beer for balance. Instead, Enjoy By is light-bodied by Double IPA standards with sugar almost absent. There’s a bit of acidity and saltiness that create quite the buoyant, lighter mouthfeel. The finish is then super clean and fairly dry without creating that common mishap of high bitterness plus dryness equating to palate abrasion. It’s dangerously easy to put down. I’m still going to say the same thing, however. Exalted IPA has a more exciting hop aroma and wicked hop bitterness while Tangerine Express remains the best all-around IPA from Stone. Sure, they are in the regular IPA segment, but Enjoy By isn’t hoppier or that much bigger of a beer. What Enjoy By does well is package up a whole lot of booze into an easy-to-drink package. It’s not what I’m looking for in a beer, but it gets the important things right: price, format, label design, mouthfeel, wide distribution. The novelty aspect will certainly continue this beer’s popularity, but there are better hop bombs out there from Stone. This is the epitome of west coast style ipa. Give so much vredit dont know any other beer to do 10 hops this well think about that. Stone is the originator in craft beer they get more hated on these days i feel. Dang dude, read some other of my Stone reviews. I am extremely positive about Stone products. It’s okay to not love every single beer. You must have gotten a different batch than the draft I had. I couldn’t finish my glass. Cloyingly sweet, boozy and decidedly NOT dank. Enjoy By used to be one of my favorites, but over production has weakened the anticipation. Besides the cloyingly sweet part, I agree with you. In my review, I say very clearly that it is alcohol-centric and not dank in the aroma.